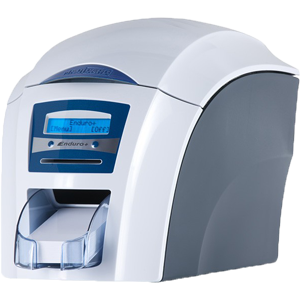 The Magicard Enduro+ is a single-sided printer which can be easily field upgraded to double-sided by means of a simple drop-in upgrade. The Magicard Enduro+ card printer is Full Colour, Dye sublimation (direct-to-card) with edge to edge printing either single sided or dual sided. The Printer is easily upgraded to a dual sided printer with drop-in upgrade kit. The user has the option to print a transparent HoloKote security watermark over the printed card image. When used with Holo Patch cards, one area of the HoloKote watermark is highlighted for distance visibility. A choice of 4 fixed HoloKote patterns are selectable from the printer driver. The Enduro+ printer is capable of full colour (YMCKO) or monochrome in black (K), white, silver or gold. Print quality is at 300dpi.